Youth Literary Awards is one of the most prestigious annual events in Hong Kong which receives hundreds of local and overseas entries every year. Wong Kwo, a graduate of the programme “Bachelor of Arts with Honour in Chinese” (2017), participated in this year’s competition and won the first runner-up and merit award in the Prose Category (Senior) and Fiction Category (Senior) respectively. 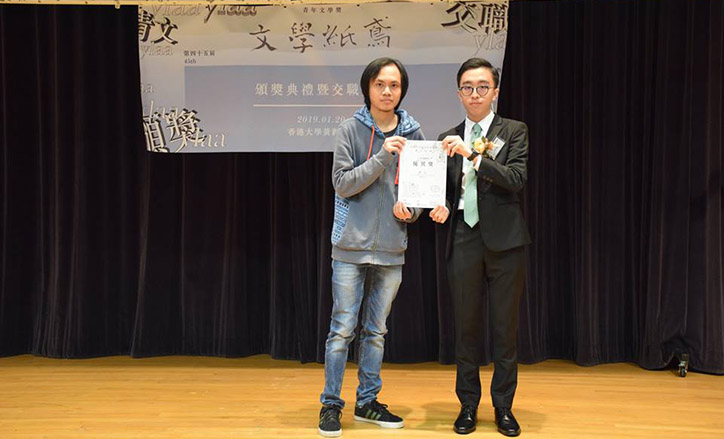 His winning entries阿狗 (prose) and 雪晴山 (fiction) along with other award-winning pieces, will be published in a collection by the organizer Youth Literary Awards Association to allow more readers to appreciate the outstanding writing skills and creativity of the winning works.